The owners of the Vesu restaurant in Walnut Creek, California, know that lighting is one of the most important aspects of a successful hospitality business. This space features another one of our favorite lighting designers and manufacturers -- Niche Modern. The Aurora pendant light fixtures are placed at varying heights over the bar adding interest and whimsy. The bottles are organized in a eye-pleasing way. 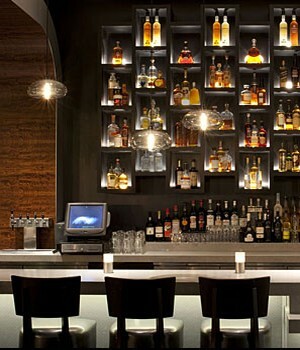 The bar has back lighting that creates an interesting glow of colors as a focal backdrop. Different woods are used on the walls and stools to create a fun feel with the stone bar, glass, and stainless steel appliances and accessories.